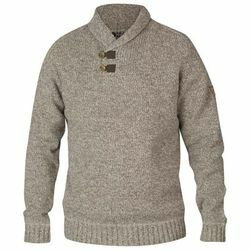 Fjallraven Lada Sweater. From the windswept Faroe Islands to the fjords of Finland, Scandinavian sheep have always been on to something. (How to keep warm). Taking a hint from these hearty, hooved mammals, we created the Lada sweater, a cozy knitted sweater in lambswool blend with a classic shawl collar and slight marbled yarn. With Corozo buttons and eyelets in G-1000 Original, pop on the Lada Sweater over a tee, or layer beneath a jacket during an autumn/winter walk.